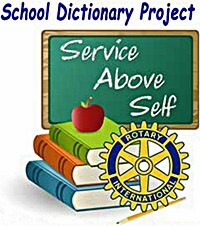 Rotary Dictionary Project Dates - Sign Up Today! Eisenhower Academy - 9 a.m.
Farragut Elementary - 9 a.m.
Forest Park Elementary - 9 a.m.
Edna Keith Elementary - 9:30 a.m.
Thomas Jefferson - 10 a.m.
T.E. Culbertson Elementary -10 a.m.
M.J. Cunningham Elementary - 10 a.m.
Issac Singleton - 9 a.m.
Sator Sanchez - 9:30 a.m.
Carl Sandberg - 10 a.m.
Taft Elementary - 10 a.m.
Lynne Thigpen - 10 a.m. Please email Ricardo at respin@rockdale.will.k12.il.us or Bob at rkase@stfrancis.edu to sign up to volunteer.